Merit DIsplay | Retail displays | How to achieve sales success! By motivating and engaging with customers, you will also make their buying experience much more enjoyable which is a strong way of maximising sales. Providing the opportunity to touch and feel. Using the right skills and experience. Robert is an ideal customer. He already knows the kind of product he wants, has the ability to pay, and has entered the retail premises on a mission to complete his purchase. Susan is not so certain. She has a rough idea of what type of product she needs, has a budget, but is mostly browsing in the hope something may present itself. Vijay is in the premises to buy something completely different but also has an awareness of other products – like yours – that he needs or may desire in the future. Encourage inspection of your product. And the best way to achieve this success is through presenting your products within an effective retail point-of-purchase display. This is particularly important when you consider that, according to extensive research, 28 percent of shoppers leave the decision on which brand to buy until inside a store, even when they have pre-planned. The OgilvyAction global study, involving 14,000 shopper interviews in 700 retail outlets across 24 markets, also found that a further 1 in 10 shoppers will switch brands inside the store. Stimulating customer engagement is, therefore, essential. Your customers are attracted to retail displays for a variety of reasons. In most cases, they will be unaware what exactly has caught their attention or how the display has influenced their buying decisions. How the retail customers will interact. Capturing attention is the initial key aim. And the more appropriately distinctive your display is, the more effective it will be. Wherever your customers’ eyes go, their feet will follow. Graphics that connect with customers’ needs and wants. Showing the products in use. Providing hands-on experience with the products. Showing the products in use or allowing customer participation are particularly influential as they help to increase knowledge and confidence. This also addresses one of the key reasons many people prefer in-store to online. A study by Big Commerce found that 49 per cent of respondents were unhappy with internet shopping due to not being able to touch, feel, or try a product. Ensuring your products are the main focal point is most important. By motivating and engaging with customers, you will also make their buying experience much more enjoyable which is a strong way of maximising sales. Of course, your retail display requires to be on-brand and retain consistency with the rest of your story – the other material and messaging that the customer may encounter. And it gives you control of the messages that are delivered at the precise point of final purchase decision. Your retail display should work seamlessly with your digital channels and provides the opportunity to enhance the customer’s overall experience of your brand. As the research shows, people still seek the experiential aspects of shopping in a physical store, even if they conduct initial research online. In another example, a survey undertaken by YouGov found that “the ability to touch, feel, and try products” was the main reason that 80 per cent of people shop in-store in the UK. Technology can also be used to merge online with offline, for example through the usage of personalisation and discount codes stored in the virtual cloud and accessed on mobile devices. Talking of clouds, in the real world an often under-utilised space sits between your retail display and the ceiling! This void can be used for signage, sign-posting, and other attention-grabbing devices. And don’t forget the power of localisation, which is easier to achieve with your physical retail display. You can tailor your displays to local market in a variety of ways from usage of dialect to reflecting demographics. You should also be aware of some of the causes of retail display problems. For example, poor quality build or neglected stand maintenance can have a disastrous effect. However, you can rest assured that all of these elements and more are taken into account at Merit when we approach retail display projects for our clients. The process features a range of skills and experience within our team, including those of an account manager, project manager, and an experienced designer. And that is before we involve the craftsmen who will build the bespoke prototypes and finished products. Desired features (screens, lights, literature, physical products etc). In addition, we will ask about your competitors and then conduct research into what they are doing with their retail displays. All of this activity helps to create the building blocks of what will result in success for you. Meeting with an account manager to create an initial outline of your needs. Research of images and other relevant information. Mock-ups of concept ideas in CAD software. Development of designs using sophisticated 2D and 3D modelling software. Creation of full visuals and overall drawings. Review and thorough prototype testing. Of course, the process doesn’t stop there. As well as maintaining a production schedule that is shared online with you, your project manager takes full responsibility for fulfilment. Often, this involves assembly on our premises prior to delivery to nationwide retail locations and installation by our expert team. 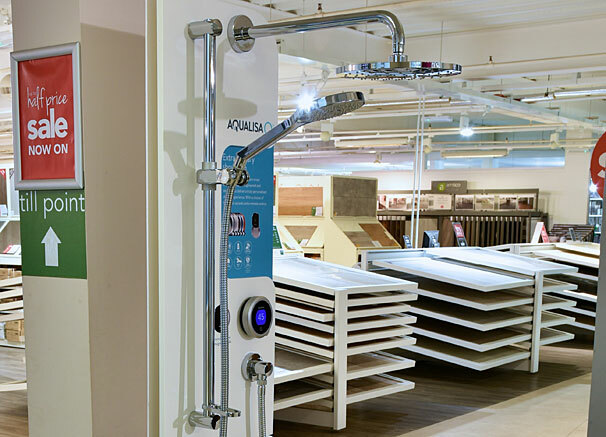 For Aqualisa, we created an interactive display to launch their first “smart” shower, Q™ EDITION. In fact, it is not just a shower, but extraordinary showering. The product is at the forefront of technology and Aqualisa wanted to create a display that would showcase the shower in each of their dealers. We were involved from the initial planning of the project to help map out a hassle-free delivery to 1249 dealers. Working through design, manufacturing, assembling, dealer co-ordination, and installation, we delivered a complete fulfilment solution. The main feature of the display is that it actually works and can be used by customers within the stores – except there’s no water! The challenge from Saint Gobain was to design and build a display that would host nine products in just one square metre of retail floor space. 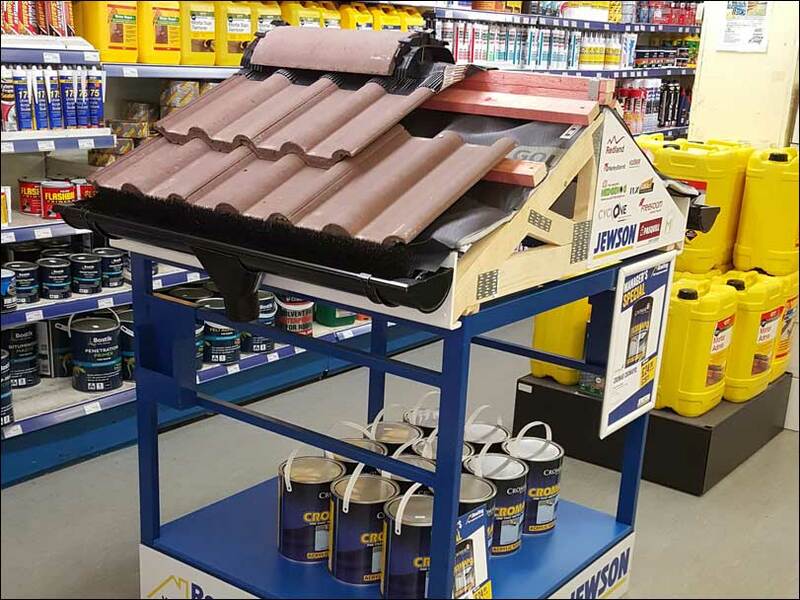 Focusing on the complete roofing offering from Jewson, the display we created clearly showed how the range of products worked together. The stand also served as a space to stock a promotion product under the roof, utilising every square inch of the retail space. Our expertise was used to design, manufacture, and assemble the clients’ products – building a complete display. We then installed the displays in more than 100 Jewson stores in just three weeks. Our fulfilment programme and project management made sure of a hassle-free delivery for both our client and every store manager. Hosting the first two stages of the Tour de France was a great opportunity for Yorkshire. To promote the event, Welcome to Yorkshire commissioned us to design and fit-out a retail space in two of the main shopping centres in the region. 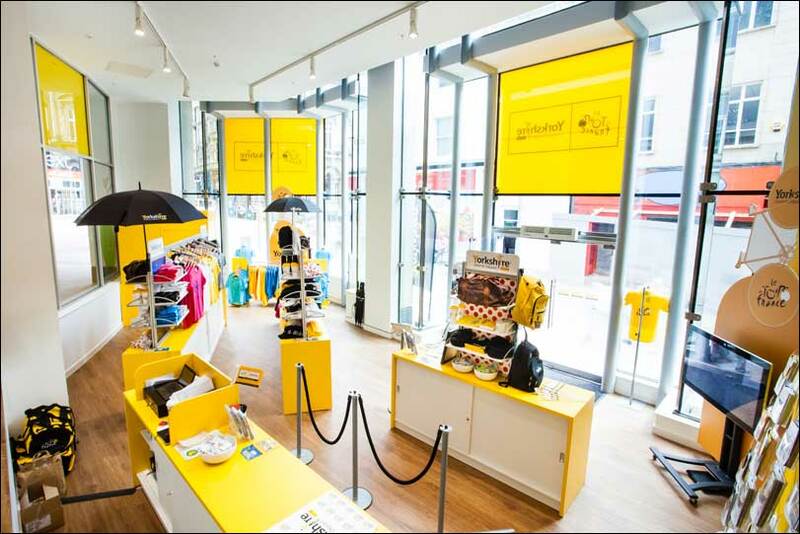 We successfully created a retail experience that fully represented the Tour de France theme, displayed the promotional products, and delivered an immersive experience. Your retail display activity can also be significantly enhanced with the Merit 360° approach so you achieve maximum effectiveness. That is based on our 25 years of delivering retail display success and includes strategy development, promotional activity, and data analysis. People may be oblivious to what encouraged them to explore a particular product. But you can be confident that, by following the correct procedures and employing the best skills, your retail display stands will produce many more customer conversions. Also, Robert will be immediately drawn to your product. Susan’s attention will be captured and converted into a purchase. And Vijay will be one of your impulse buyers!